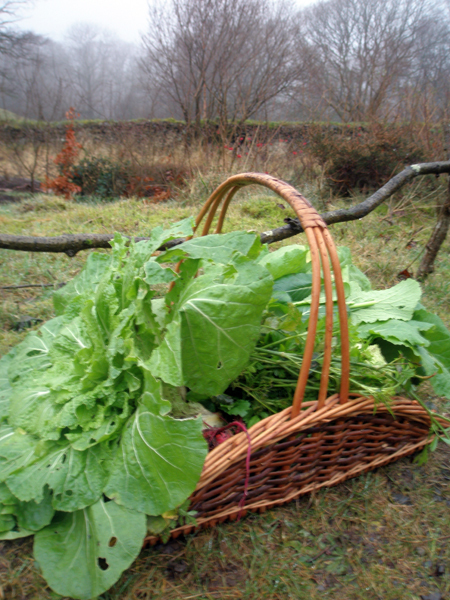 After several weeks of neglect following our temporary move away from Lawson Park, the Kitchen Garden looked a tad forlorn when I started my tidy-and-harvest session today. There were - surprisingly - quite a few passers-by despite the drizzle, but I do miss having the cats around when I'm there now - they however think nothing of their wild former home as they lounge among the central heating in our new place. The Honesty Stall would have done good business had I anything green to spare for sale. Whilst I have left Lawson Park in the safe hands of our new gardener George, I’ve been spending three weeks in rural north-west Japan, on an arts project within the Echigo Tsumari Triennale exhibition. It’s really the first time I’ve been outside of Europe to a place with so much horticultural novelty. To the European eye, one of the most painful things to witness here is the regular maintenance of mountain paths, which requires hacking down overgrown acers and other rare-to-us trees by the dozen. Our village, Toge, produces Japan’s finest rice, apparently due to abundant summer rain and heavy winter snow which stays put for months. And boy can it rain – and coming from someone who lives in the Lake District and was brought up on the west coast of Scotland, that’s saying something. 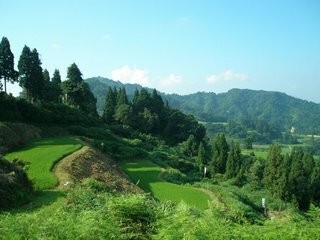 The land below the velvety forests is steeply terraced, with small-ish, spring fed rice paddies divided by ditches and banks of verdant wild undergrowth. On closer inspection this undergrowth is made up of some recognisable plants: macleaya cordata (plume poppy), aruncus diocus, various small bamboos, a kind of carex grass, vines and the occasional orange lily. Further afield one drives past what look like Madonna lilies also growing wild – large stems of showy white blooms. Morning glory, blue hydrangea, phlox, rudbeckia and daisy-like coreopsis seem common on the fringes of gardens, as are various crocosmia and species gladioli – I’m not sure if these are native or not. Gardens here rarely have dividing boundaries, and lack many of the characteristics one associates with Japanese gardens traditionally: it’s a farming community and I guess they have no time for fiddly bonsai. However, each house has a rectangular or sometimes corner-shaped pond right by it, usually filled with waterlilies and carp. 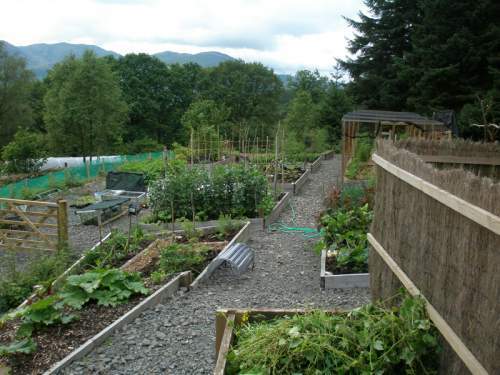 Highly productive vegetable gardens are sited on level areas close to every house - there are few areas of useful land unused – even small triangles of ground by roads are filled with vegetables. The soil seems to be clay subsoil with sandy topsoil. The dominant crops are aubergines and cucumbers though there are many unfamiliar shoots and stems in between that I would like to identify. 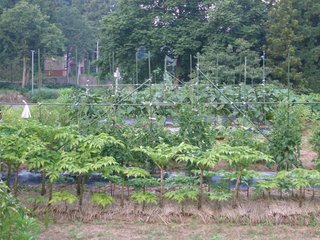 Maintenance-wise, the fight against weeds must be a depressing task: horsetail and others grow inches per day and only the tomatoes and aubergines are mulched with plastic. I expect the banks between terraces are allowed to grow wild to prevent subsidence, and much of the leafy growth is eaten too. I was curious as to why the weeding I have seen is done by just removing the top growth with a machete, and I suspect it’s both for eating and because root removal would encourage land subsidence in the next heavy downpour. Composting seems not to happen here and I am curious as to why, as I’d expect the humid heat to enable very fast decay. The only top dressing I have noticed looked a lot like dried rice husks sprinkled around young plants – as I haven’t seen any snail or slugs I’m not sure what this does. By our house and in the most appallingly wet conditions, a noted Japanese landscape architect has designed and installed a rather bizarre garden which marries European-style flower-planting with Japanese hard landscaping. Some noteable features include chicken-wire gabions filled with pebbles as pond-banks, heavily charred hardwood as a building and water feature material (I’ve read this is believed to preserve the timber), and a high stacked log wall. The quality of the materials is very high, and they are used very simply, however the workmanship of the installation is rather poor - this might be because it’s a ‘show garden’, but there’s a real sense that it could all slip off down the hillside during the next downpour.